A brief background. Kurama ended up in his human body the day he is today when he was heavily wounded one day by a reikai detective, and had to hide and heal, and he found the body of a human in Ningenkai, and began to manifest his power and presence onto the body. Being a cunning and devious youko for perhaps a thousand years, Kurama is the oldest (youkai wize) in the group of four, and no doubt the most intellegent after a thousand years of learning and experience, added to the cunning and deviousness of foxes. However, I see no link between foxes and plants, but Kurama has mastery over all sorts of plants, from spiky bamboos to blood sucking plants. All of which can be used in fighting. Unlike the other three, Kurama is not heavily into close range fighting, and prefers to stay at long distances with ranged attacks, or relying on just his plants. He has been extremely calm against every enemy he's faced except for Karasu at the Ankoku tournament. 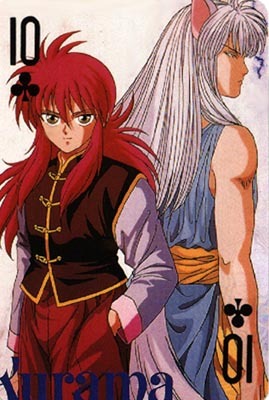 Kurama was able to turn back into his youko form during the Ankoku in the semi finals. If you've seen pictures of him, you'll not be surprised why there is such a great population of Kurama fans, mainly female I would presume. It just so happens that although he is already 'suave' in his youko form, he also happened to be able to pick a human body with equal looks as his original form, with long alluring red hair. Kurama has almost a deep obssesion of love for his human mother, who loves him just as dearly. However, his reason for loving her is that she had 'accepted' him even though he was a youkai, in disguise. The irony of it is, that his mother thinks that he is her son, and had never thought of him being a youkai (Kurama has never told his mother), not that any mother would have any sane reason to believe that their child was a hiding place for one of the most wanted in Reikai. I feel sorry for the poor little soul destined for Minamino Shuichi's body, but what the hell, Kurama's character is probably heaps better.